generates heat inside the body. but this is not true. Believe me, ripe papaya is good for health but it has to be consumed in correct quantity. It is good to have once in a week. It is also good to heal the stomach ulcer and helps easy digestion. Papaya fruit gives skin glow, prevents heart attack by reducing the cholesterol level. 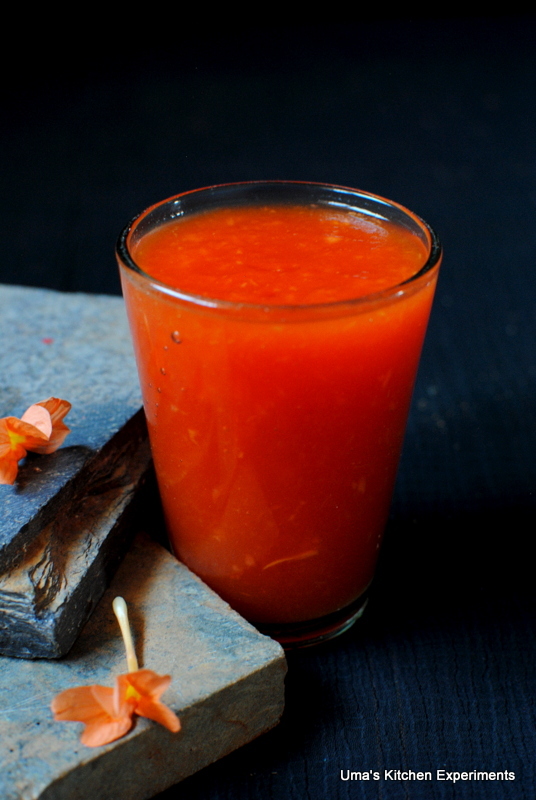 I prepared this juice using the papaya with red color flesh. I used to get only yellow flesh papaya in Chennai and when I saw this red colored flesh papaya here in my native, tempted to make juice and click. I am posting it under this week's beverages series since I don't have any other recipes at hand as of now. 1) Cut the papaya in lengthwise. Remove the seeds using spoon. Using the same spoon, scoop out the flesh from it. This way you can easily separate flesh from skin. I got 3 cups of flesh from one large papaya. 2) Put the flesh in a blender/juicer. 3) Add sugar and blend it for 1-2 minutes. 4) Add water and blend again for 10-20 seconds. 5) Pour in glasses and serve chill with ice cubes. 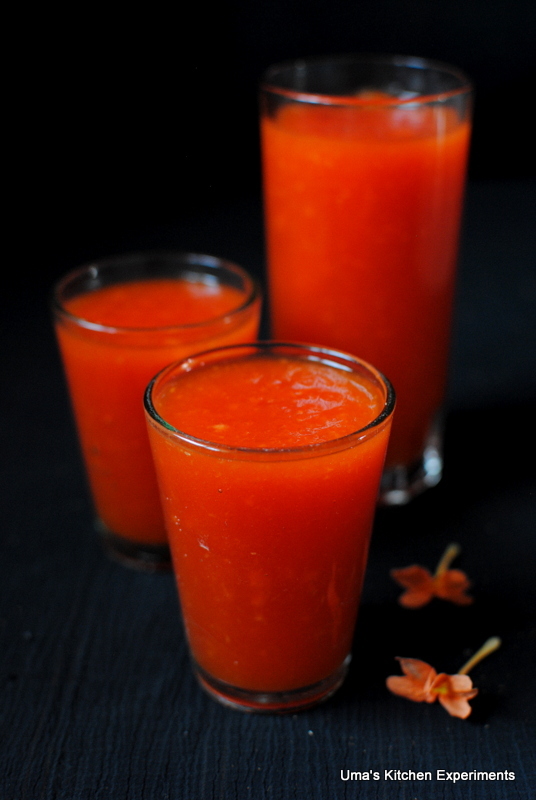 1) Use only ripe papaya to make this juice. 2) Adjust the sugar quantity based on your taste buds. Kanakaambaram poo enga pudicheenga Uma? You have the plant at home or what? It's been years I have seen this flower! We get the red ones here but I always crave for the yellow ones that I grew up eating from our garden. I am with you on the benefits of papaya. 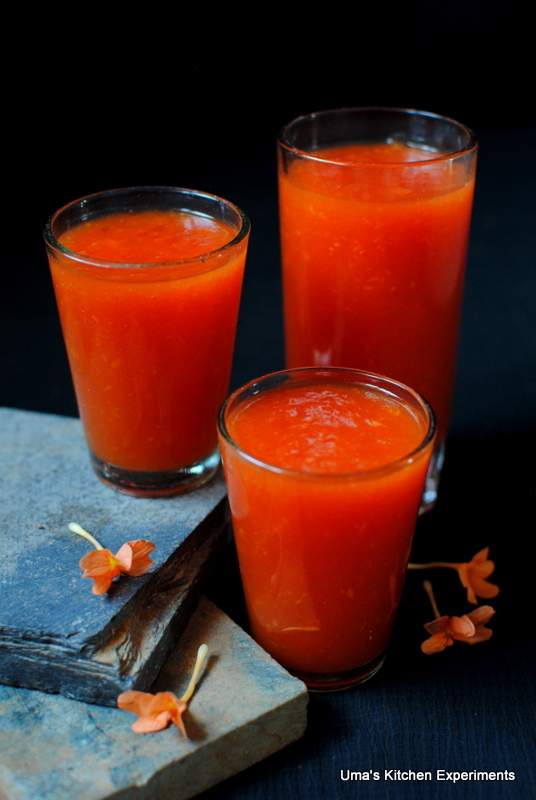 Papaya juice looks so tempting Uma..loved the vibrant red color..Nice clicks as always. Love the colour n nice presentation!! Papaya is one among few fruits that I'm not fond of. But your click makes me to try this ;) Loved the bright colour!!! oh wow...Mouthwatering here...Loved the drink...so tempting and delicious! to the same i used to add 1/2 cup milk...very healthy and delicious drink..i take this fruit/juice regularly..loved its vibrant color...beautiful pics uma! 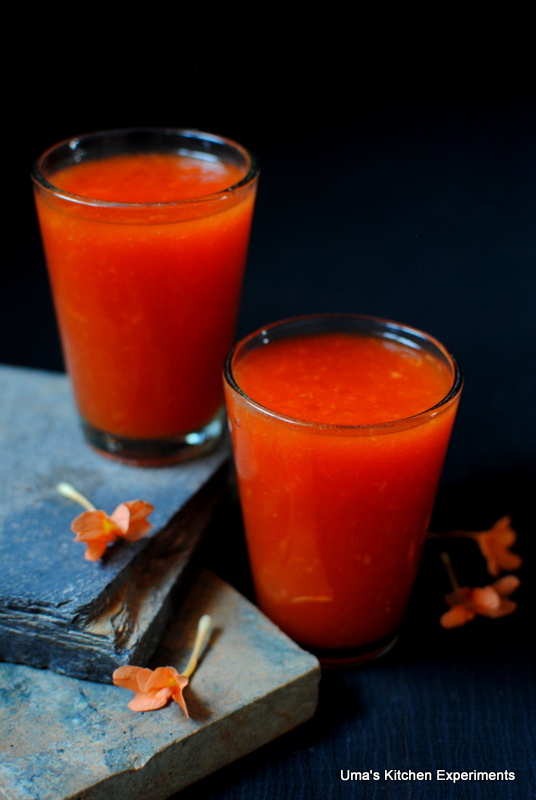 Healthy and refreshingly cool papaya drink. Worth trying,we have to hunt for such colored papayas in Delhi,During winters we do get such "Disco" another name for colored papayas. Colorful and refreshing juice.. Love the presentation and the clicks. Specially, the kanagaambaram poo in the picture makes me nostalgic. looks nice. very useful information with the beautiful clicks. great 1 to start a day,love d colour.